I’ve been scrambling around doing some last minute Halloween decorating, which reminds me how much easier the holidays are when you organize and plan ahead. So today I’m posting some holiday planning tips. 1. Buy Now. I know it’s tempting to hit all those great holiday sales. But unless your looking to get a great deal on toys and big ticket items, I recommend that you start shopping now. There’s a relative calm in the stores right now, but a month from now there will be chaos as the Christmas shoppers fill the aisles. So buy as many gift items (and even holiday grocery supplies) as you can before Thanksgiving. 2. Cyber Monday. Another way to avoid the long lines at the store is to skip the Black Friday sale, and do your shopping via the internet on Cyber Monday. 3. Christmas Cards. Get an early start on your Christmas cards. 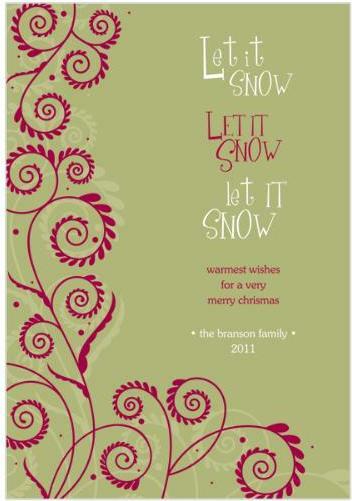 Online sources like Storkie allow you to order personalized, festive Christmas cards in classic and contemporary styles. 4. Gift List. Lists are such a helpful tool for organizing. Each year I write down the names of everyone I have to get a gift for. Next to each name I write down some gift ideas I have in mind for that person, and on this same sheet I plan out my budget. 5. Thrift Store Decor. I’m always finding great deals on Christmas decorations at the thrift stores. There may be a lot to sort through, but you can often find really good Christmas balls, ornaments, and even some cute wreaths. The thrift store is also a great place to find craft supplies to make your own Christmas decor. 6. Menu Planning. If you do a lot of cooking around the holidays, it’s good to plan your menu. Even if you just make a few dishes to carry to potlucks, you can greatly simplify the task by writing down what you plan to make, and then creating your holiday grocery list ahead of time. 7. Gift Wrapping. Get plenty of wrapping paper, tape, bags, and other supplies so that you don’t have to make extra trips to the store. Be sure to get an entire roll of paper or a giant gift bag for large children’s gifts. Also, reuse bags when you can, and shop for your supplies at the dollar store to save money. 8. Make a Calendar. Use your planner or print out special calendars for November and December so that you can write down dates for parties, Christmas pageants, and events that you and your family will participate in. 9. Holiday Chore List. Make a list or use your calendar to organize and plan all the holiday chores that need to be done: decorating, cooking for a particular event, cleaning house, etc. 10. Sales and Coupons. If you can’t buy now, be sure to plan your holiday shopping around sales and coupons. Companies that sell baking supplies and other seasonal items will soon start issuing coupons for the holiday season. Also, places like Hobby Lobby have lots of great Christmas stuff, and they have sales every week, so it’s easy to get a good deal if you just plan ahead. Disclosure: I wrote this blog post while participating in the Storkie holiday blogging program. I received compensation for my participation. All opinions are 100% mine. Good ideas! I like to coupon shop so now is the time to start,especially for those hot toys. Thanks for sharing about the stock up on wrapping paper, it does sell out fast. Next month will get busier with holiday shopping. I hope to plan ahead.